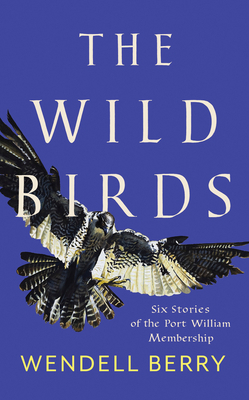 As part of Counterpoint's celebration of beloved American author Wendell Berry comes this reissue of his 1986 classic, The Wild Birds: Six Stories of the port William Membership. Those stories include "Thicker Than Liquor," "Where Did They Go?," "It Wasn't Me," "The Boundary," "That Distant Land," and the titular "The Wild Birds." Spanning more than three decades, from 1930 to 1967, these wonderful stories follow Wheeler Catlett, and reintroduce readers to the beloved people who live in Berry's fictional town of Port William, Kentucky. WENDELL BERRY, an essayist, novelist, and poet, has been honored with the T.S. Eliot Prize, the Aiken Taylor Award for poetry, the John Hay Award of the Orion Society, and the Richard C. Holbrooke Distinguished Achievement Award of the Dayton Literary Peace Prize, among others. In 2010, he was awarded the National Humanities Medal by Barack Obama, and in 2016, he was the recipient of the Ivan Sandrof Lifetime Achievement Award from the National Book Critics Circle. Wendell lives with his wife, Tanya Berry, on their farm in Henry County, Kentucky.